LONDON (Reuters) - Burberry's new creative designer has had an "exceptional" response to his debut collection, but it will take time to turn around a business where first-half revenue and operating profit both fell, the luxury brand said on Thursday. Former Givenchy star Riccardo Tisci's first designs for the British label, which included metallic trimmings and corset-like belts on Burberry's trademark trenchcoats, wowed critics and buyers alike when they were shown in September. "The initial response from influencers, press, buyers and customers to our new creative vision and Riccardo's debut collection 'Kingdom' has been exceptional," Chief Executive Marco Gobbetti said. But he added his multi-year turnaround was only in the first phase and translating the buzz around the brand into better financial results would take time. 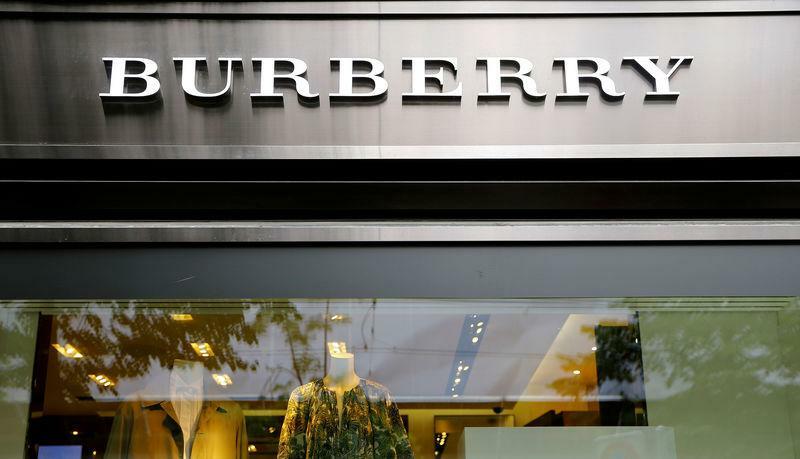 While luxury brands have benefited from a rebound in Chinese demand and interest from younger shoppers, Burberry has lagged rivals such as LVMH's Louis Vuitton and Kering's Gucci, leading to Tisci's appointment in March. Burberry reported revenue of 1.22 billion pounds ($1.60 billion) for the 26 weeks to Sept. 29, down 3 percent but ahead of analyst forecasts, and adjusted operating profit of 178 million pounds, down 4 percent. It said its outlook for the full year for broadly stable revenue and adjusted operating margin at constant exchange rates and cost savings of 100 million pounds, was unchanged. Chief Financial Officer Julie Brown said the response to Tisci's collection, which will be in store in February, had been strong, with wholesalers in Europe, Middle East and Africa doubling their previous order levels. But bigger orders from high-end department stores would be more than offset by a cut in supplies to other retailers, particularly in the United States, as Burberry pursues a plan to elevate the brand into the higher levels of luxury, she said. Its shares were up 2 percent to 1,852 pence at 1217 GMT. Analysts at Citi, who have a "neutral" rating on the stock, said the turnaround was on track. "While we appreciate the continued focus on new product initiatives, refreshed store concept, sales productivity, ecommerce and cost control, the jury's still out on the timing and magnitude of brand turnaround," they said. Gobbetti said the early results were encouraging but there was still a lot to do. "We need to sustain and expand our heat," he said. "It takes time to really change consumers' perception of a brand." He said renewing all product lines wouldn't be complete until well into next year, but Burberry would be keeping excitement levels high with limited releases of products - on the 17th of the month, Tisci's favourite number.